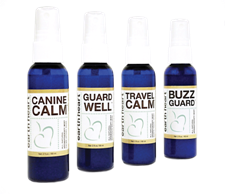 Guard Well helps dogs find relief from environmental irritants. The natural remedy mist is specially made to help relieve itching, swelling, skin problems and other minor illnesses. Dog lovers and professionals recommend Guard Well. as a safe and effective natural remedy in over 90% of dogs exposed to lawn or pool chemicals, environmental irritants, dry air, viruses, bacteria or long-term use of medications. Guard Well contains pure essential oils of niaouli, ravensare and frankincense and is easy to use. It can be sprayed directly onto cloth, skin or fur without staining or leaving a sticky residue. This family friendly product is safely diluted for use with puppies from 8 weeks old. Directions: Simply spray on fingertips to massage a dog’s outer ear or abdomen, lightly mist the dog’s favorite blanket or bedding, or spray directly onto irritated skin. Use one or two mists for small, young or infirm dogs and for medium to large dogs it may be necessary to use four to six mists. Guard Well is made in the USA and packaged in a BPA free recyclable container. Ingredients: water, polysorbate 20 (emulsifier); pure essential oils of niaouli, ravensare and frankincense; potassium sorbate (preservative). Guard Well® 2 fl.oz. There are about 600 mists in a bottle. Earth Heart is a natural line of products designed using plant based ingredients that help dogs live happier and healthier lives. They are made in the United States by certified aromatherapist and master herbalist, Vick Rae Thorne.